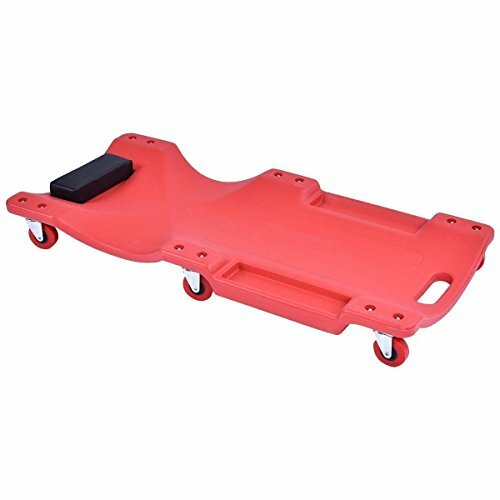 This is our 36" red lisle large wheel plastic creeper. The Big Red 36 in. Plastic Creeper is great for use in garages and at the shop. It is crafted with HDPE plastic for durability and features a thick foam headrest pad for added comfort during use. The creeper can hold up to 300 lbs. It is very helpful with your fixing work. Do not hesitate to have one! 【300 Pounds Weight Capacity】It is made of heavy duty plastics, which has 300 pounds weight capacity.Durable construction ensures its long-term service lifespan. 【Six Solid and Rotatable Wheels】It comes with 6 wheels for easy moving. Each of them is solid and durable to support the weight on creeper.Wheels can be rotated 360 degrees. 【Ergonomic Design】This ergonomic designed creeper brings comfortable lying experience. A soft headrest is included to support your head in a more easeful posture. Each side has a tray to put tools for convenience. 【Easy to carry】This plastic creeper tool only weighs 8.4pounds. It is easy to transport. 【Size Info】Overall Dimensions: 36"x17"x4"(L X W X H). Package includes one repair creeper and one hex wrench.